I first encountered Charles Sanders Peirce from the writings of John Sowa about a decade ago. I was transitioning my research interests from search and the deep Web to the semantic Web. Sowa’s writings are an excellent starting point for learning about logic and ontologies . I was particularly taken by Sowa’s presentation on the role of signs in our understanding of language and concepts . Early on it was clear to me that knowledge modeling needed to focus on the inherent meaning of things and concepts, not their surface forms and labels. Sowa helped pique my interest that Peirce’s theory of semiotics was perhaps a foundational basis for getting at these ideas. In the decade since that first encounter, I have based my own writings on Peirce’s insights on a number of occasions . I have also developed a fascination into his life and teachings and thoughts across many topics. I have become convinced that Peirce was the greatest American combination of philosopher, logician, scientist and mathematician, and quite possibly one of the greatest thinkers ever. While the current renaissance in artificial intelligence can certainly point to the seminal contributions of George Boole, Claude Shannon, and John von Neumann in computing and information theory (of course among many others), my own view, not alone, is that C.S. Peirce belongs in those ranks from the perspective of knowledge representation and the meaning of information. Peirce is hard to decipher, for some of the reasons outlined below. Yet I have continued to try to crack the nut of Peirce’s insights because his focus is so clearly on the organization and categorization of information, essential to the knowledge foundations and ontologies at the center of Structured Dynamics‘ client activities and my own intellectual passions. Most recently, I had one of those epiphanies from my study of Peirce that scientists live for, causing me to change perspective from specifics and terminology to one of mindset and a way to think. I found a key to unlock the meaning basis of information, or at least one that works for me. I try to capture a sense of those realizations in this article. Since it was the idea of sign-forming and the nature of signs in Peirce’s theory of semiosis that first caught my attention, it makes sense to start there. The figure to the right shows Peirce’s understanding of the basic, triadic nature of the sign. Triangles and threes pervade virtually all aspects of Peirce’s theories and metaphysics. 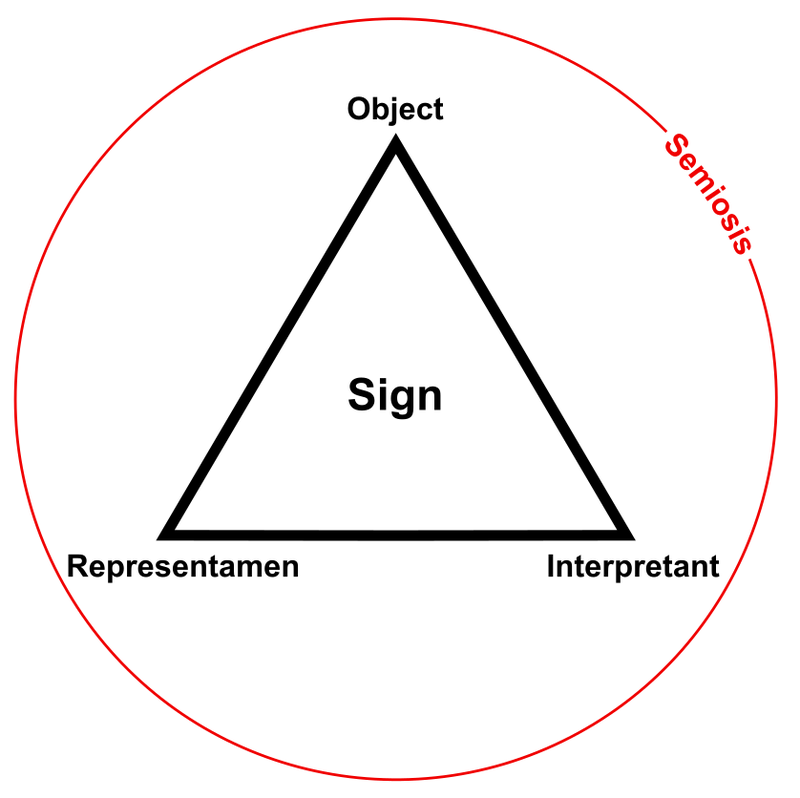 For Peirce, the appearance of a sign starts with the representamen, which is the trigger for a mental image (by the interpretant) of the object . The object is the referent of the representamen sign. 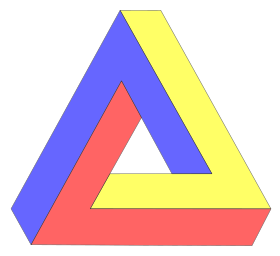 None of the possible bilateral (or dyadic) relations of these three elements, even combined, can produce this unique triadic perspective. A sign can not be decomposed into something more primitive while retaining its meaning. A sign is an understanding of an “object” as represented through some form of icon, index or symbol, from environmental to visual to aural or written. Complete truth is the limit where the understanding of the object by the interpretant via the sign is precise and accurate. Since this limit is rarely (ever?!) achieved, sign-making and understanding is a continuous endeavor. The overall process of testing and refining signs so as to bring understanding to a more accurate understanding is what Peirce called semiosis . In Peirce’s world view — at least as I now understand it — signs are the basis for information and life (yes, you read that right) . Basic signs can be building blocks for still more complex signs. This insight points to the importance of the ways these components of signs relate to one another, now adding the perspective of connections and relations and continuity to the mix. Because the interpretant is an integral component of the sign, the understanding of the sign is subject to context and capabilities. Two different interpretants can derive different meanings from the same representation, and a given object may be represented by different tokens. When the interpretant is a human and the signs are language, shared understandings arise from the meanings given to language by the community, which can then test and add to the truth statements regarding the object and its signs, including the usefulness of those signs. Again, these are drivers to Peirce’s semiotic process. While it is true that most of these distinctions are important ones in a foundational ontology, that does not mean that the entire ontology space should be dichotomized between them. Further, with the exception of Sowa’s ontology , none of the more common upper ontologies embrace any semblance of Peirce’s triadic perspective. Further, even Sowa’s ontology only partially applies Peircean principles, and it has been criticized on other grounds as well . The triadic model of signs was built and argued by Peirce as the most primitive basis for applying logic suitable for the real world, with conditionals, continua and context. Truthfulness and verifiability of assertions is by nature variable. The ability of the primitive logic to further categorize the knowledge space led Peirce to elaborate well a 10-sign system, followed by a 28-sign and then a 66-sign one . Neither of the two larger systems were sufficiently described by Peirce before his death. Though Peirce notes in multiple places the broad applicability of the logic of semiosis to things like crystal formation, the emergence of life, animal communications, and automation, his primary focus appears to have been human language and signs used to convey concepts and thoughts. But we are still mining Peirce’s insights, with only about 25% of his writings yet published . Robert Burch has called Peirce’s ideas of “indecomposability” the ‘Reduction Thesis’ . Peirce was able to prove these points with his form of predicate calculus (first-order logic) and via the logics of his existential graphs. My intuition of the importance of the third part of the triad comes from such terms as perspective, gradation and probability, concepts impossible to capture in a binary world. C.S. Peirce embraced a realistic philosophy, but also embedded it in a belief that our understanding of the world is fallible and that we needed to test our perceptions via logic. Better approximations of truth arise from questioning using the scientific method (via a triad of logics) and from refining consensus within the community about how (via language signs) we communicate that truth. Peirce termed this overall approach pragmatism; it is firmly grounded in Peirce’s views of logic and his theory of signs. While there is absolute truth, in Peirce’s semiotic process it acts more as a limit, to which our seeking of additional knowledge and clarity of communication with language continuously approximates. Through the scientific method and questioning we get closer and closer to the truth and to an ability to communicate it to one another. But new knowledge may change those understandings, which in any case will always remain proximate . Peirce greatly admired the natural classification systems of Louis Agassiz and used animal lineages in many of his examples. He was a strong proponent of natural classification. Though the morphological basis for classifying organisms in Peirce’s day has been replaced with genetic means, Peirce would surely support this new knowledge, since his philosophy is grounded on a triad of primitive unary, binary and tertiary relations, bound together in a logical sign process seeking truth. Again, Peirce called these Firstness, Secondness, and Thirdness. Fifth, and possibly most importantly, most Peircean scholarship appears to me to be more literal with an attempt to discern original intent. Many arguments seem fixated on nuance or terminology interpretation as opposed to its underlying meaning or mindset. To put it in Peircean terms, most scholarship of Peirce’s triadic signs seems to be focused on Firstness and Secondness, rather than Thirdness. The connections of Peirce’s sign theory, his three-fold logic of deduction-induction-abduction, the role he saw for the scientific method as the proper way to understand and adjudicate “truth”, and his really neat ideas about a community of inquiry have all fed my intuition that Peirce was on to some very basic insights. My Aha! moment, if I can elevate it as such, was when I realized that trying to cram these insights into Peirce’s elaborate sign terminology and other literal aspects of his writing were self-defeating. The Aha! arose when I chose rather to try to understand the mindset underlying Peirce’s thinking and the triadic nature of his semiosis. The very generalizations Peirce made himself around the rather amorphous designations of Firstness, Secondness, Thirdness seemed to affirm that what he was truly getting at was a way of thinking, a way of “decomposing” the world, that had universal applicability irrespective of domain or problem. Thus, in order to make this insight operational, it first was necessary to understand the essence of what lies behind Peirce’s notions of Firstness, Secondness and Thirdness. The other interesting aspect of Peirce’s Thirdness is how relations between Firstness, Secondness and Thirdness are treated. Because of the sort of building block nature inherent in a sign, not all potential dyadic relations between the three elements are treated equally. According to the ‘qualification rule’, “a First can be qualified only by a first; a Second can be qualified by a First and a Second; and a Third can be qualified by a First, Second, and a Third” . Note that a Third can not be involved in either a First or Second. The best way to glean meaning from this table is through some study and contemplation. Because these examples are taken from many contexts, it is important to review this table on a row-by-row basis when investigating the nature of ‘Thirdness’. Review of the columns helps elucidate the “natural classes” of Firstness, Secondness and Thirdness. Some items appear in more than one column, reflecting the natural process of semiosis wherein more basic concepts cascade to the next focus of semiotic attention. The last row is a kind of catch-all trying to capture other mentions of Thirdness in Peirce’s phenomenology. The table spans from the fully potential or abstract, such as “first” or “third”, to entire realms of science or logic. This spanning of scope reflects the genius of Peirce’s insight wherein semiosis can begin literally at the cusp of Nothingness  and then proceed to capture the process of signmaking, language, logic, the scientific method and thought abstraction to embrace the broadest and most complex of topics. This process is itself mediated by truth-testing and community use and consensus, with constant refinement as new insights and knowledge arise. Reviewing these trichotomies affirms the fulsomeness of Peirce’s semiotic model. Further, as Peirce repeatedly noted, there are no hard and fast boundaries between these categories . Forces of history or culture or science are complex and interconnected in the extreme; trying to decompose complicated concepts into their Thirdness is a matter of judgment and perspective. Peirce, however, was serene about this, since the premises and assignments resulting from such categorizations are (ultimately) subject to logical testing and conformance with the observable, real world. Our excursion into Peirce’s foundational, triadic view was driven by pragmatic needs. Structured Dynamics‘ expertise in knowledge-based artificial intelligence (KBAI) benefits from efficient and coherent means to represent knowledge. The data models and organizational schema underlying KR should be as close as possible to the logical ways the world is structured and perceived. A key aspect of that challenge is how to define a grammar and establish a logical structure for representing knowledge. Peirce’s triadic approach and mindset have come to be, in my view, essential foundations to that challenge. The way I interpret this (in part) is that categories in which new ideas or insights have arisen — themselves elements of Thirdness for that category — are targets for new categorization. That new category should focus on the idea or insight gained, such that each new category has a character and scope different from the one that spawned it. Of course, based on the purpose of the KBAI effort, some ideas or insights have larger potential effect on the domain, and those should get priority attention. As a practical matter this means that categories of more potential importance to the sponsor of the KBAI effort receive the most focus. We are basing this process of categorization upon the same triadic design noted above. However, now that our context is categorization, the nature of the triad is different than that for the basic sign, as the similar figure to the right attests. In Thirdness we are contemplating the category, thinking about it, analyzing it, using and gaining experience with it, such that we can begin to see patterns or laws or “habits” (as Peirce so famously put it) or new connections and relationships with it. The ideas and insights (and laws or standardizations) that derive from this process are themselves elements of the category’s Thirdness. This is where new knowledge arises or purposes are fulfilled, and then subsequently split and codified as new signs useful to the knowledge space. As domains are investigated to deeper levels or new insights expand the branches of the knowledge graph, each new layer is best tackled via this three-fold investigation. Of course, context requires its own perspectives and slices; the listing of Thirdness options provided above can help stimulate these thoughts. But, of course, interrelationships adhere to the Peircean Thirdness and there continues to be growth and additions. Categories thus tend to fill themselves up with more insights and ideas until such time as the scope and diversity compel another categorization. In these ways categorization is not linear, but accretive and dynamic. (human or machine) What are the ingredients, ideas, essences of the category? What are the new things or relationships of the category? What are the laws, practices, outputs arising from the category? The essential point is to break free from Peirce’s often stultifying terminology and embrace the mindset behind Thirdness. Categorization, or any other knowledge representation task for that matter, can be approached logically and, yes, systematically. Just as perspective does not occur without Thirdness, I think we will see Peirce’s contributions make a notable difference in how knowledge representation efforts move forward. A driver of this change is knowledge-based artificial intelligence. I feel like problems and questions that have stymied me for decades are lifting like so much fog as I embrace the Peircean Thirdness mindset. I think that it is possible to codify and train others to use this mindset, which is really but a specialized application of Peirce’s overall conception of semiosis . Twenty five years ago Nathan Houser opined that “. . . a sound and detailed extension of Peirce’s analysis of signs to his full set of ten divisions and sixty-six classes is perhaps the most pressing problem for Peircean semioticians” . I agree with the sense of this opinion, but the ten divisions and sixty-six classes are a sign classification; the greater primitive for Peirce’s thinking is the triad and his application of it across all domains of discourse. This is the better grounding for understanding Peirce. 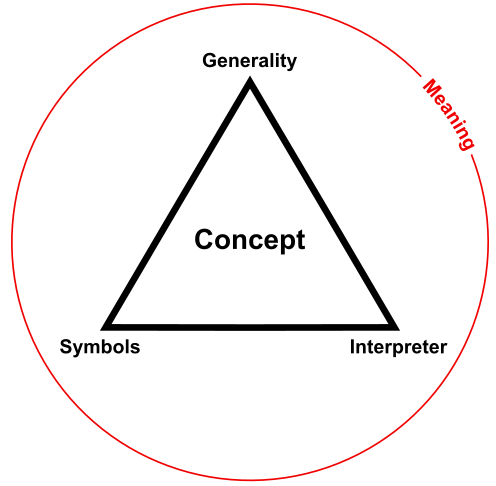 John Sowa, mentioned in the intro, also put forward a knowledge representation, which he partially attributed to Peirce [2,4], and included the three basic elements of the sign triad. But Sowa did not infuse his design with the Peircean triad, with the amalgam criticized for its lack of coherency . Peircean ideas have also informed computational approaches  and language parsing . Nonetheless, despite important Peircean ideas and contributions across the knowledge representation spectrum, I have been unable to find any upper ontology or vocabulary based on Thirdness. Terminology can get in the way. In the intro, I mentioned my epiphany from specifics to mindset in Peirce’s teachings. This insight has not caused me to suddenly understand everything Peirce was trying to say, nor to come to some new level of consciousness. However, what it has done is to open a door to a new way of thinking and looking at the world. I am now finding prior, knotty problems of categorization and knowledge representation are becoming (more) tractable. I am excited and eager to look at some problems that have stymied me for years. Many of these problems, such as how to model events, situations, identity, representation, and continuity or characterization through time, may sound like philosophers’ mill stones, but they often lie at the heart of the most difficult problems in knowledge modeling and representation. Even the tiniest break in the mental and conceptual logjams around such issues feels like major progress. For that, I thank Peirce’s triads. See Sowa’s Web site, especially the sections on ontology, knowledge representation, and publications. See, for example, John F. Sowa, 2000. “Ontology, Metadata, and Semiotics,” presented at ICCS 2000 in Darmstadt, Germany, on August 14, 2000; published in B. Ganter & G. W. Mineau, eds., Conceptual Structures: Logical, Linguistic, and Computational Issues, Lecture Notes in AI #1867, Springer-Verlag, Berlin, 2000, pp. 55-81. May be found at http://www.jfsowa.com/ontology/ontometa.htm. Also see John F. Sowa, 2006. “Peirce’s Contributions to the 21st Century,” presented at International Conference on Conceptual Structures, Aalborg, Denmark, July 17, 2006; and  below. I have written a number of pieces based primarily around Peirce’s insights; see, for example, http://www.mkbergman.com/category/peircean-principles/. John F. Sowa, 2001. “Signs, Processes, and Language Games: Foundations for Ontology,” in Proceedings of the 9th International Conference On Conceptual Structures, ICCS’01. 2001. Peirce actually spelled his approach as semeiosis, but I use the simpler version here. See also separate discussion of pragmaticism. For example, Peirce said : “Thought is not necessarily connected with a brain. It appears in the work of bees, of crystals, and throughout the purely physical world; and one can no more deny that it is really there, than that the colors, the shapes, etc., of objects are really there.” (CP 4.551). At first this seems rather strange. However, “thought” for Peirce in this context is the notion of the process by which the sign is recognized and interpreted. See also . Also see, for example, the use of trichotomies in philosophy or some of the nature of three in mathematics or religion. J. Locke, 1690. “An Essay Concerning Human Understanding”, Book II, Chapter XXXIII. Reprinted, 1964: 249. John Y. Yolton, Ed. Dutton. New York, NY. Ludger Jansen, 2008. “Categories: The Top-level Ontology,” Applied ontology: An introduction (2008): 173-196. P. Farias and J. Queiroz, 2003. “On Diagrams for Peirce’s 10, 28, and 66 Classes of Signs“, Semiotica 147(1/4), pp.165-184. Robert Burch has called Peirce’s ideas of “indecomposability” the ‘Reduction Thesis’; see Robert Burch, 1991. A Peircean Reduction Thesis: The Foundations of Topological Logic, Texas Tech University Press, Lubbock, TX. Peirce’s reduction thesis is never stated explicitly by Peirce, but is alluded to in numerous snippets. The basic thesis is that ternary relations suffice to construct arbitrary relations, but that not all relationscan be constructed from unary and binary relations alone. M.K. Bergman, 2016. “Re-thinking Knowledge Representation,” AI3:::Adaptive Information blog, March 14, 2016. Amongst many, see, for example, Janos J. Sarbo and József I. Farkas, 2013. “Towards Meaningful Information Processing: A Unifying Representation for Peirce’s Sign Types,” Signs-International Journal of Semiotics 7 (2013): 1-44. In that article, the authors state: ” . . . our model has the potential of representing three types of relation, consisting of 10, 28, and 66 elements, that are analogous to Peirce’s three classifications of signs. This implies the possibility of a common representation for Peirce’s different classifications.. . . By virtue of the above relation with Peircean semiotics, and because of the fundamental nature of signs, our approach has the potential for a uniform modeling of information processing in any domain, theoretically.” Two other researchers of Peircean signs are, for example, P. Farias and J. Queiroz, 2003. “On Diagrams for Peirce’s 10, 28, and 66 Classes of Signs”, Semiotica 147(1/4), pp.165-184. Also, the Web site Minute Semiotic is dedicated to one interpretation of Peirce’s signs, including interactive descriptions (from the author’s perspective) of the 66 Peircean signs. David Savan, 1987-1988. “An Introduction to C.S.Peirce’s Full System of Semeiotic,” Monograph Series of the Toronto Semiotic Circle. Vol. 1. Table sources and the order of presentation very roughly move from the primitive to the more complex and elaborative. The idea of Firstness may range from something like an energetic input that causes chemicals to combine into a new structured form or ordered state to something like a new recognition in the mind occasioned by a flick of the eye or a shifting thought. The representamen is merely a potential sign until it is energized or intrudes on consciousness, wherein the object is now made apparent as interpreted. The process of reifying the sign itself produces a new reality, its Thirdness, which can then become a subject of the sign-recognizing process in its own right. In this regard, Peirce was formulating a theory of signs that could describe how more order may occur in the world, including the formation and evolution of the cosmos and the initial origins of life. Nathan Houser, 1992. “On Peirce’s Theory of Propositions: A Response to Hilpinen.” Transactions of the Charles S. Peirce Society 28, no. 3 (1992): 489-504. See, for example, Gary Richmond’s trikonic approach: Gary Richmond, 2005. “Outline of trikonic Diagrammatic Trichotomic,” in: F. Dau, M.L. Mugnier, and G. Tumme, ed., Conceptual Structures: Common Semantics for Sharing Knowledge: 13th International Conference on Conceptual Structures, ICCS 2005, Kassel, Germany, 17–22 July 2005. Springer-Verlag GmbH, pp. 453 – 466. See, for example, one of the earlier examples, John F. Sowa, 1991. “Toward the Expressive Power of Natural Language.” Principles of Semantic Networks (1991): 157-189. The triadic model of signs was built and argued by Peirce as the most primitive basis for applying logic suitable for the real world, with conditionals, continua and context. Truthfulness and verifiability of assertions is by nature variable. Because of the signs' groundings in logic, Peirce's three main forms of deductive, inductive and abductive logic also flow from the same approach and mindset. The data models and organizational schema underlying KR should be as close as possible to the logical ways the world is structured and perceived. Peirce's contributions make a notable difference in how knowledge representation efforts may move forward.